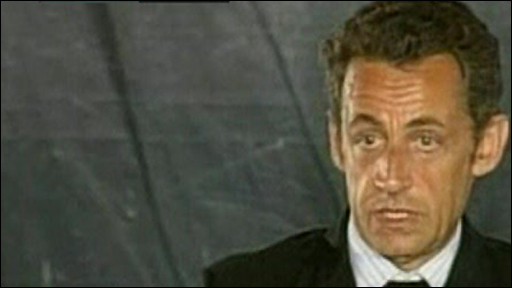 French President Nicolas Sarkozy has agreed an outline plan with Russia and Georgia to try to resolve their crisis. A key element calls for all forces to return to the areas where they were before fighting broke out last week. EU foreign ministers in Brussels are discussing the plan at an emergency meeting on the crisis. Some 100,000 people are estimated to have been displaced by the conflict, which has created huge tensions in international relations. The BBC's Gabriel Gatehouse, in Georgia, says fighting in the South Ossetia region does now seem to have ended. On Tuesday, Russia announced its military activity in the area was completed and witnesses saw troops pulling out. However on Wednesday, journalists and eyewitnesses reported seeing Russian tanks patrolling the streets of Gori, the nearest major Georgian town to the South Ossetian border. Russia has held all the cards in this conflict and looks set to end up with both a diplomatic and a military victory, says the BBC's Caroline Wyatt, in Moscow. It has shown its power within the region and the weakness of the West, which has been unable and unwilling to come to Georgia's aid with anything other than words of support, our correspondent adds. Despite the diplomacy and apparent withdrawal, rhetoric on both sides remained fiery and analysts were predicting a long road to peace. On Wednesday, Georgian President Mikhail Saakashvili accused Russia of violating the ceasefire with troop movements around the country, while asserting that the ceasefire on the Georgian side was always in force. "They went through our towns and they are rampaging and they are also shooting," he said at a news conference in the Georgian capital, Tbilisi. He also said he had been getting reports of large-scale violations of human rights by Russian forces: "What we are seeing is classic Balkan-type and WWII-type ethnic cleansing and purification campaigns," he said, speaking of a Russian "rampage" through Georgian-controlled villages in South Ossetia and in Abkhazia. 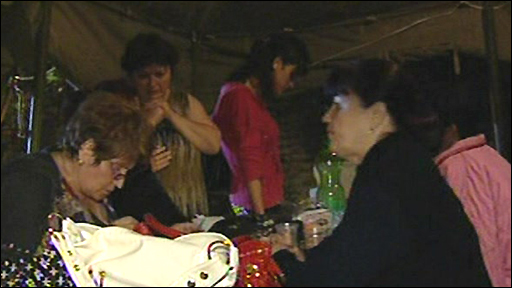 A BBC correspondent in Tbilisi says there have been reports of extensive looting and kidnappings by gunmen around the town of Gori. Shortly after the Georgian president spoke, Russian Foreign Minister Sergei Lavrov condemned the actions of the Georgian leadership in South Ossetia. "Georgia - of course, not Georgia, but the Georgian leadership - gave an order which led to an act of genocide, which resulted in war crimes, ethnic cleansing. And this, of course, cannot go unanswered." Russian troop reinforcements would be withdrawn from South Ossetia, depending on the extent to which Georgian troops did the same, he added. Mr Lavrov also said that Russian peacekeepers would remain in South Ossetia. Aid agencies on the ground say they have not come across any evidence of human rights violations. "It is clear that both sides are exaggerating, and that figures are inflated," Giorgi Gogia of Human Rights Watch told the BBC News website from Tbilisi. France - which currently holds the EU presidency - wants Wednesday's meeting to endorse its peace initiative before it is submitted to the UN Security Council. The ministers are to consider sending peacekeepers to secure a ceasefire between Russia and Georgia, and protect humanitarian supplies. UK Foreign Secretary David Miliband has said Russian troops in Georgia should withdraw to pre-7 August positions and criticised the country's "19th-Century way" of doing politics. Mr Sarkozy, in his current role as EU president, held talks with President Medvedev in Moscow for most of Tuesday before flying to Tbilisi, where his arrival was greeted by emotional displays. He held news conferences with both Mr Medvedev and Mr Saakashvili - with all three leaders saying they had agreed in principle to a five-point plan. A sixth point in the plan, about holding international discussions on the future status of South Ossetia and Abkhazia, had been deleted with the agreement of Mr Medvedev, Mr Sarkozy and Mr Saakashvili said. "The territorial integrity and belonging of South Ossetia and Abkhazia to Georgia can never be put under doubt," the Georgian leader said. On Wednesday, the Russian army said 74 of its soldiers were killed, 171 were wounded and 19 were missing, the AFP news agency reports. In Abkhazia, Georgia said its troops had withdrawn from the only area of the breakaway province they still occupied following a Russian offensive there, the Kodori Gorge. The self-styled president of Abkhazia said it was in control of the disputed upper reaches of the gorge and that its forces had pushed Georgian troops out of the area a day earlier. The US has meanwhile said it is cancelling an annual joint naval exercise with Russia, scheduled for the end of this week in the Sea of Japan. A US official told news agencies there was no way Washington could "proceed with this joint exercise at this time". US Secretary of State Condoleezza Rice warned that Russia was "frankly... doing great damage" to its prospects for integrating into international organisations. In a reference to the Soviet Union's invasion of Czechoslovakia, she said Moscow's behaviour belonged to "another time". "We are not in 1968 and the message has been very clear to Russia that it cannot operate that way," she told the US channel ABC News. Making Wednesday a day of national mourning in Russia, President Dmitry Medvedev accused Georgia of mounting a "genocide of the South Ossetian people". In his decree on national mourning, Mr Medvedev, who on Tuesday called Georgian troops "thugs" [Russian: otmorozki], did not give figures for civilian casualties in South Ossetia, but said they were "numerous". 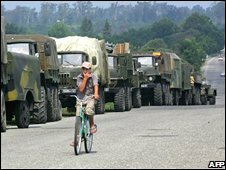 Russia moved in forcefully, sending troops into South Ossetia and Abkhazia, another breakaway province. Georgian towns away from the two regions were also bombed. Fighting flared last Thursday night when Georgia sent its army to regain control of South Ossetia - a region nominally part of Georgia, but with de facto independence and where a majority of people hold Russian passports.